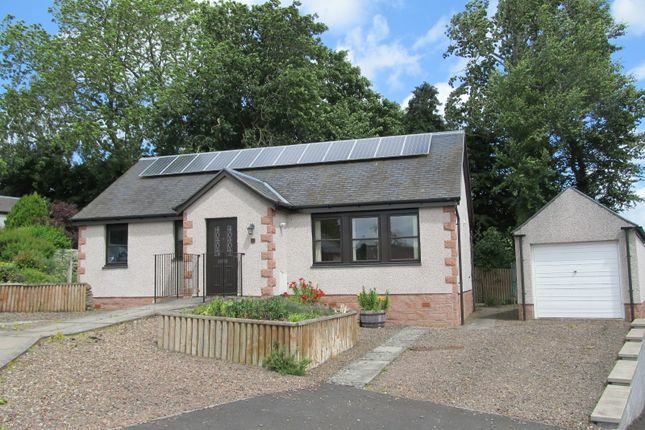 2 Jean Lawrie Court is a most desirable detached bungalow situated in a quiet cul-de-sac within a popular residential area close to all village amenities and having lovely countryside walks close by. Bright accommodation, in good order, comprises:- Entrance Vestibule, Livingroom, Fitted Dining Kitchen, Inner Hall, 3 Bedrooms, Bathroom and Detached Garage. A low maintenance garden surrounds the property, laid mostly in gravel, with a rockery area at the side containing a range of established plants and shrubs. There is also a paved patio area and private parking for 2/3 cars. The property benefits from gas central heating, full double glazing and is being offered for sale with all fitted carpets, floor coverings, curtains, blinds and light fittings. A timber door with glazed panels opens into a small vestibule. Coat hooks. Cupboard containing c/h boiler. Glass 15 panel door to livingroom. Carpet. Spacious room with window to front giving a lovely open outlook. Vertical binds and curtain pole. C/h radiator. Smoke alarm. Coving. 3 double power points. Dado rail. TV aerial. Telephone point. Fitted carpet. Dining kitchen with window to rear. Stainless steel sink unit with drainer. Excellent range of fitted base and wall units with contrasting worktops and tiling between. Electric cooker point and cooker hood. 4 double and 2 single power points. C/h radiator. Plumbed for washing machine. Fitted carpet. Door to garden at rear. With c/h radiator. Smoke alarm. 1 double power point. Hatch to attic space. Fitted carpet. Single bedroom with window to rear. Fitted wardrobe with hanging rail, shelving and mirror doors. C/h radiator. 2 double power points. TV aerial. Telephone point. Fitted carpet. Double bedroom with window to rear. Fitted wardrobe with hanging rail, shelving and mirror doors. C/h radiator. 2 double power points. TV aerial. Fitted carpet. Bright double room with window to front giving a lovely open outlook. C/h radiator. 2 double power points. Fitted carpet. Bright and spacious bathroom with frosted glass window to front and roller blind. Cream suite comprising WC, corner wash hand basin, bath with shower attachment off taps and a separate fully tiled shower cubicle with mira shower. Extractor fan. C/h radiator. Tiled to dado on all walls. Fitted carpet. At the side of the property sits a detached garage with up and over door, window to rear, concrete floor, rafter storage and a side door to garden. The garden is mostly gravelled for ease of maintenance. The front garden has a raised central flower bed and there is parking at the side for 2/3 cars. On the other side is an established rockery with range of mature plants and shrubs. At the rear is a paved patio and clothes drying area. All fitted carpets and flooring are included in the sale along with the blinds and light fittings. The solar panels are also included in the sale. The property is on the highest tariff of 52.72 pence per unit under a 25 year agreement from 2011. The rights under the agreement are assignable to a purchaser.